In October of 2016, on behalf of the Robert Wood Johnson Foundation (RWJF), Lori Melichar, Director of RWJF’s Pioneer Portfolio, invited Atlas of Caregiving founder and CEO Rajiv Mehta to New York City. The Robert Wood Johnson Foundation supports people with bold visions in building a healthy future, or a Culture of Health. Rajiv and the 50 additional pioneering individuals invited to the meeting have been recognized and supported by RWJF for addressing some of the nation’s toughest health challenges. At the core of the meeting was a focus on the equity challenges that are fundamental to RWJF’s vision. “A future that leaves large segments of our society behind is not a Culture of Health,” says Lori Melichar. To this group, Rajiv shared how Atlas of Caregiving sees caregivers as fundamental to a Culture of Health. As a result, Atlas catalyzes actionable information on the realities of family caregiving, while also delivering relevant solutions to make caregiving easier and more effective. Here is a recording of Rajiv’s presentation with key points outlined below. 1) We can’t value what we don’t see, and we don’t improve what we can’t value. What we think about as healthcare is just the tip of the iceberg of caring. Friends and family perform the vast majority of care. And yet, it’s hard to find a major social issue that is as little studied as family caregiving. Perhaps because it is unseen, undervalued, and therefore not a focus for improvement. 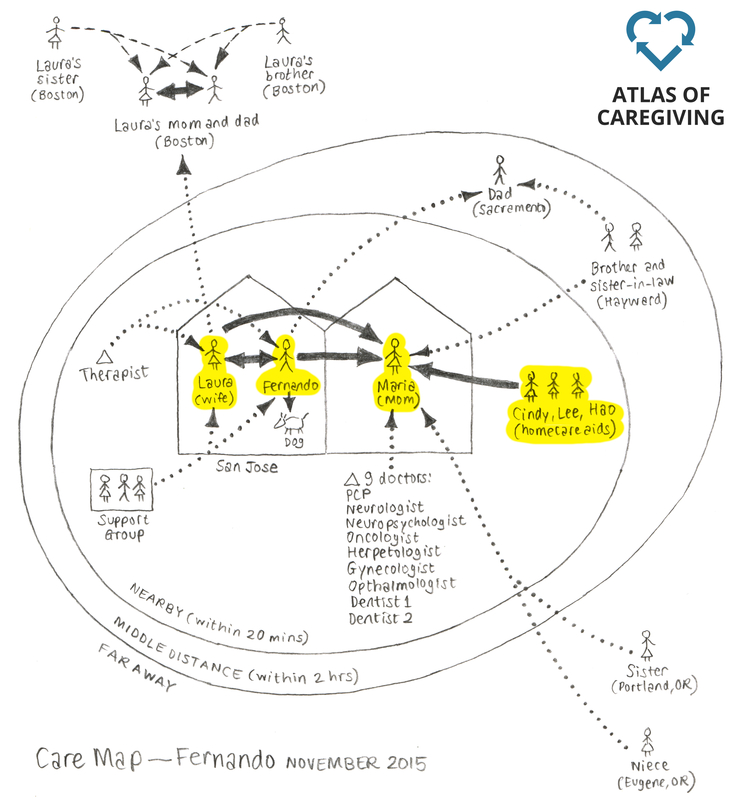 Atlas of Caregiving aims to understand what is the lived reality of day to day caregiving, to make the invisible visible. 2) Community Based Action-Research with participants not subjects. From our pioneering research, practical solutions like the CareMap diagram and CareMap Workshops were conceived. As Atlas experimented with CareMaps in community settings like Santa Barbara, we learned the benefits of including local institutions in the research and saw that because of their involvement, they were able to view their own community in a different way, revisiting how best to support community members. Our community based action-research, a method that combines ethnography and technology in close collaboration with communities helps develop practical tools for self-discovery and community awareness – in other words, it enables communities and individuals to better see themselves. As a result, communities are able to deepen their empathy, increase their experimentation, and quicken change. 3) A moonshot is needed, not just a little more of the same. The CareMap and CareMap Workshops are two of the practical, research-based tools we are developing to promote deep and quantifiable understanding of how caregiving impacts our daily lives. Through visualization, opportunities to support exploration and self-discovery emerge. Additionally, by revealing actionable information about an individual’s and a community’s caregiving experience, solutions can be designed with deeper insight and more intention. To expand the adoption of CareMaps, Atlas has partnered with AARP to deliver CareMap Workshops in cities across the nation. By facilitating the use of CareMaps in different communities and families, and by engaging them as participants in the design of their community support infrastructure, we are providing a foundation for purposeful exploration and impactful change.